Did you ever have a zit on your face? If so, you wanted it gone, right? Zits, much like tree stumps, are a nuisance you wish would go just go away. Now some people live in areas where a couple tree stumps in the yard don’t really matter. They’re “out in the country” and have huge lots and they love nature, figuring stumps are no big deal. The other 95% of people do not agree. Furthermore, if you’re trying to cut the grass and there are a bunch of little stumps in the front yard, do you know how hard it is to cut around them every time? You can’t get really close to them, so your yard starts looking messy, with weeds and things growing up around stumps. And when those stumps get hidden it’s not uncommon for people to literally trip over them or stub their toes walking into them. And there’s this: do you want stumps to damage your lawn mower? Of course not. Leaving a tree stump in the ground will cause new trees to grow at and around it. This will look odd! Once these “shoots” sprout, they’ll be everywhere and hard to remove. Don’t let that happen. Finally, stumps attract insects. As they decay and rot in your yard they become a feast for bugs like wood borers and termites. If you don’t want those bugs around/near your house, get rid of stumps. 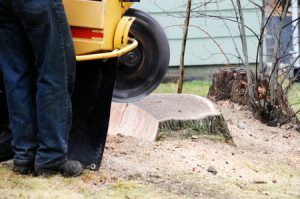 In and around Kingwood, Texas, the place to call for stump grinding and stump removal services is Forest Tree Service at 281-359-7874.